Suzhou has a unique geographical and historical status in China. Being the largest city in Shanghai neighborhood (only 100km away from Shanghai, the commercial and financial center of China), it has become one of the fastest growing major cities in the world, with GDP growth rates of about 14% in the past 35 years. With high life expectancy and per capita incomes, Suzhou's Human Development Index ratings is roughly comparable to a moderately developed country, making it one of the most highly developed and prosperous cities in China. Located in southeastern Jiangsu Province, at the central Yangtze River Delta, it is one of the most important cities in the Yangtze River Economic Zone formed by Shanghai, Jiangsu and the Zhejiang Provinces. In 2009, the GDP of the Yangtze River Economic area surpassed 1 trillion U.S. dollars for the first time and became the 11th largest economic zone in the world. Founded in 514 BC, Suzhou has over 2,500 years of history, with an abundant display of relics and sites of historical interest. The city's canals, stone bridges, pagodas, and meticulously designed gardens have contributed to its status as one of the top tourist attractions in China. The Classical Gardens of Suzhou were added to the list of the UNESCO World Heritage Sites in 1997 and 2000. 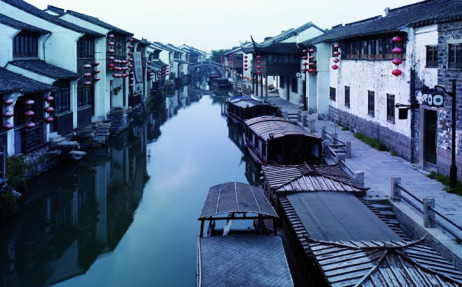 Suzhou is often dubbed the "Venice of the East" or "Venice of China". 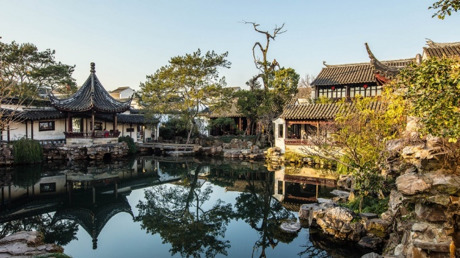 Nine classical gardens such as the Zhuozheng Park, Xuan Xiu Villa, the Canglang Pavilion, Shizi Mountain, Yipu, the Coupling Park, and the Siyishan Park have all been listed as "World Cultural Heritage". Tiger Hill, Panmen, Lingyan Mountain, Yushan are all famous scenic spots. The China Grand canal Suzhou section was also selected onto the World Heritage List. Further, Suzhou is a representative city of the ancient Wu culture. Twelve Chinese historic and cultural towns include Zhouzhuang in Kunshan, Tongli in Wujiang and others which are all located in Suzhou. 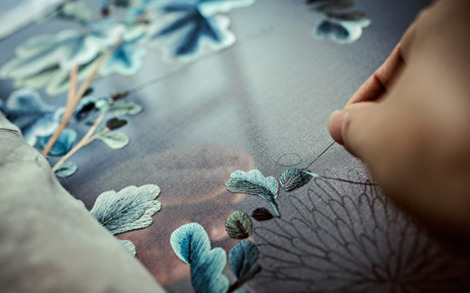 It is also the hometown of various kinds of silk productions like Suzhou embroidery and brocade of Song Dynasty, the famous green tea Biluochun and traditional wood paintings. Having a reputation of being called the “land of plenty”, it is a city of gastronomy as well. 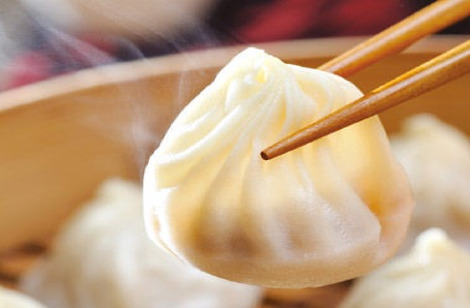 Residents from neighborhood areas often pay intentional visits to Suzhou for soup dumplings, beggar chicken, mandarin fish and special lake productions such as saury, white shrimps and lake crabs. 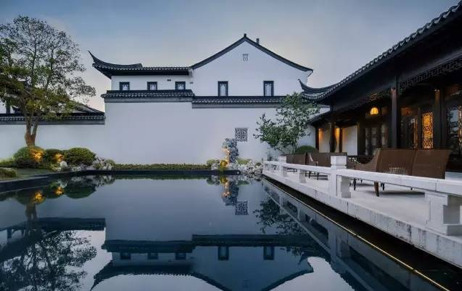 In October, Suzhou has great weather – cloudy to sunny with rare signs of rain, and the temperature starts to cool down from the hot summer, ranging from 14℃ (57.2 F) to 21℃ (69.8 F). 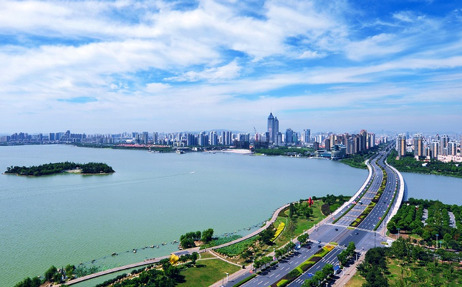 Suzhou is featured with a world-level International Science Park (SISPARK), located within Suzhou Industrial Park, which is one of the largest industrial parks in China, economically and geographically. The Science Park is currently a hot spot for venture capital, with over 16 billion RMB of venture capital funds being operated. The incubators are mostly science- and technology- related, such as biomedicine, nanotechnology, IC design, software development and new energy. 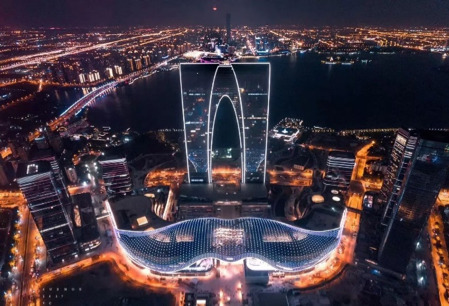 It has an overall planned area of 61 hectares, a building area of 1.14 million square meters, and an investment of more than RMB 4 billion Yuan. The Science Park is a National Scientific Enterprise Incubator of China, National Software Industrial Base, National Animation Industrial Base, China Euro-America Oriented Software Offshore Project Pilot Base, and Entrepreneur Centre for returned oversea Chinese students. For over ten years’ development, the Science Park has formed four characteristic industrial clusters, namely, software development, IC design, digital entertainment and industrial application of high and new technologies and established relatively sound public technical platforms consecutively. SISPARK is endeavoured to realize a revenue of 500 million USD from offshore software and accumulate 55,000 high-tech R&D talents, a total production value breaking through 10 billion, and foster 20 enterprises whose turnover exceeds one-hundred million to build a high-tech industrial park with complete infrastructure, distinctive industrial features, significant renovation and a highly developed service system. SISPARK took the lead in laying out the artificial intelligence industry supported by big data and cloud computing and gathered industry leaders such as Baidu, Huawei, Tencent, Apple, Microsoft, and Siemens to introduce and nurture a group of leading independent innovation enterprises in China. It has accelerated the rise of a leading domestic and internationally renowned artificial intelligence companies.